Turkish-backed Syrian fighters are pictured in the back of their trucks as they leave their barracks in the rebel-held border town of Jarabulus, Dec. 25, 2018, as they prepare to move toward Manbij. In a statement, the Syrian army said its troops were taking up key positions, adding it "guarantees full security for all Syrian citizens and others present." But the U.S.-led coalition fighting the Islamic State terror group responded on Twitter, saying it "has seen no indication that these claims are true." "We call on everyone to respect the integrity of Manbij and the safety of its citizens," the coalition added. "We still have troops there," the official said, cautioning the U.S. remains focused on the safe and orderly withdrawal of U.S. troops from Syria. "The situation is stable for now," Badran Chiya, a Syrian Kurdish adviser, told VOA's Kurdish service Friday. "The daily life of the people continues normally. There is no tension." "We are still supporting the integrity of Syrian soil. These areas belong to Syria," Erdogan told reporters following Friday prayers in Istanbul. "Once the terrorist organizations leave the area, we will have nothing left to do there." 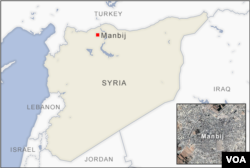 "It's not just about Manbij. We are aiming to wipe out all terrorist organizations in the region. Our main target is that the YPG takes the necessary lesson here," Erdogan added. Despite Erdogan's comments, Turkish-backed Syrian rebels said Friday that they were continuing to advance on Manbij with Turkish forces and fight if needed "to start military operations to liberate" the city. Kremlin spokesman Dimitry Peskov called the presence of Syrian forces in the city a "positive step." Following a meeting Friday in Moscow with Jordan's foreign minister, Russian Foreign Minister Sergey Lavrov told reporters that Russia wants "concrete explanations" from the U.S.
"It appears that Washington wants to shift the responsibility," Lavrov said. Friday's flurry of activity came as key regional players prepared for the complete withdrawal of U.S. forces from the country, a move announced just last week by Trump. "Everybody is negotiating; the Russians are in the middle of it and clearly the Americans are, too," Joshua Landis, who heads the Middle East department at the University of Oklahoma, told VOA. "The Syrian army doesn't want to get into a clash with Turkey. That would be a losing proposition. Neither does the YPG or anyone else," Landis added. 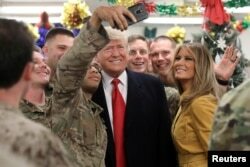 FILE - U.S. President Donald Trump and first lady Melania Trump greet military personnel at the dining facility during an unannounced visit to Al Asad Air Base, Iraq, Dec. 26, 2018. During a visit with U.S. troops in Iraq on Wednesday, Trump defended his decision to pull them out, declaring IS's self-declared caliphate defeated. "I think a lot of people are going to come around to my way of thinking," he said. "Our presence in Syria was not open-ended and it was never intended to be permanent." VOA's Kurdish service and Ed Yeranian contributed to this report.